MSSC SYSTEM is the world's first system that integrates all existing rules in sports shooting of all global organizations: ISSF, FITASC, IPSC, MLAIC, USPSA, STEEL, IDPA, 3 GN. Administrative, financial, competitions, arbitration management... MSSC SYSTEM integrates all necessary for the development of the activity that a club, federation or whatever tool the shooters needs. MSSC, the first system in the world for the planning of sports resources in the shooting world. We revolutionized the ERP for your club or federation. SRP (Sportive Resource Planning). It feels like the palm of your hand becomes a powerful tool through MSSC SYSTEM. Manages, controls, trains, competes... Everything and more from a single tablet or Smartphone. Train with MSSC SYSTEM. Share, compare, study, invite and follow your workouts with other shooters or follow the instructions of your trainer as if beside you. More motivating in groups. 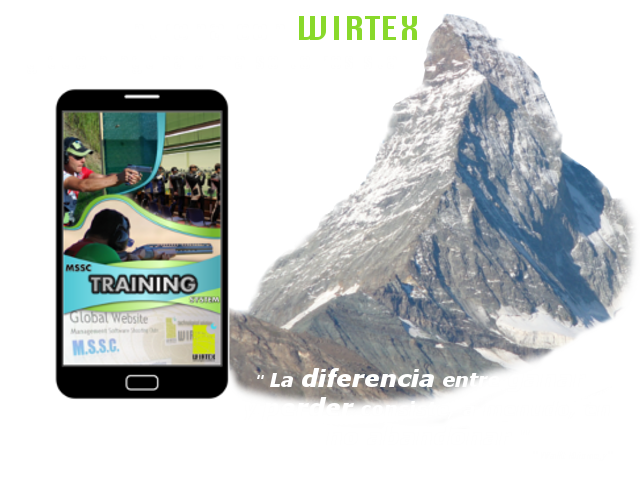 WIRTEX suits you, no matter the size of your club or federation, or the level you have. You can have MSSC for less than the cost of a box of ammunition. With all the guarantees of a company with over 20 years experience and backed by shooters and organizations. Benefits for coaches who hire MSSC Training. Using all the advantages offered by the news cloud technologies. Papers with the MSSC SYSTEM are ended system can do all digitally. Experiment with a new way to enjoy your favorite sport. *Each logo is owned by their respective organizations. If you want to hire or learn more about MSSC SYSTEM fill out the form below and we will contact you as soon as possible.